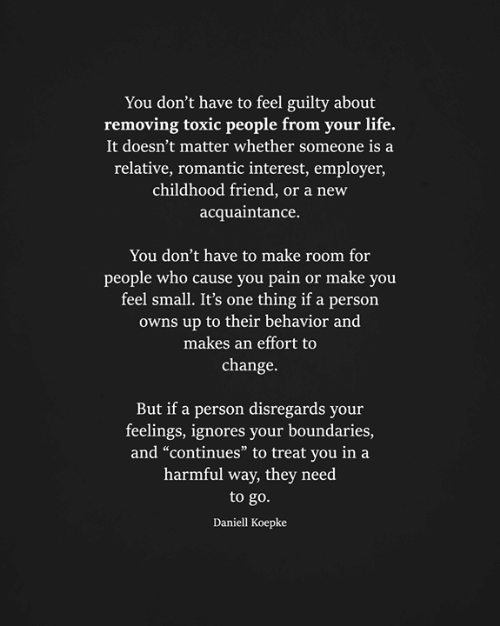 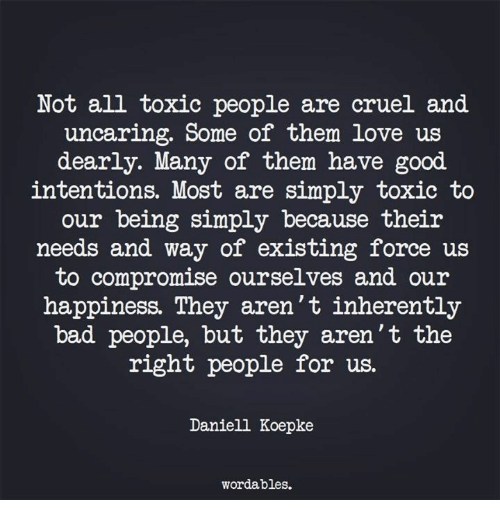 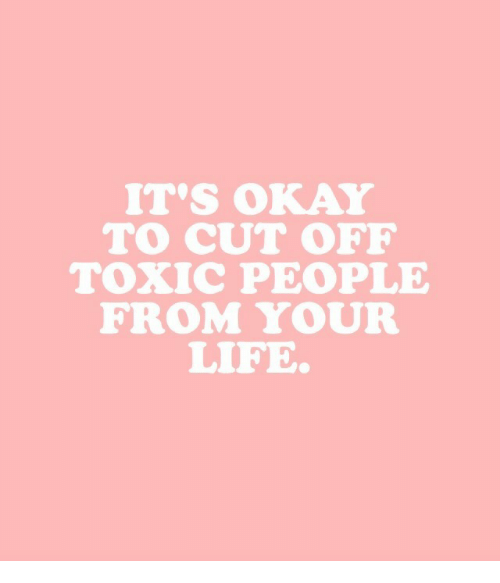 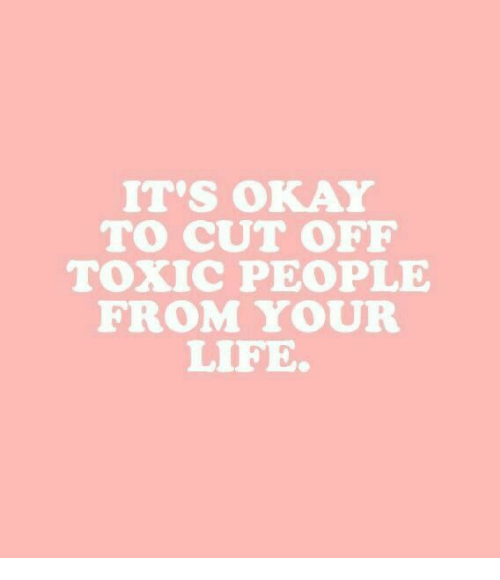 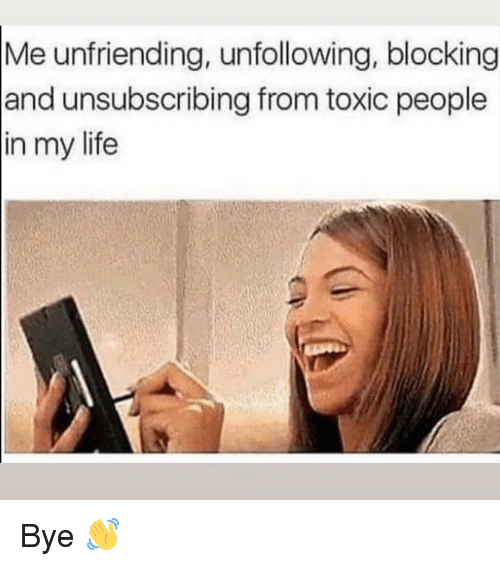 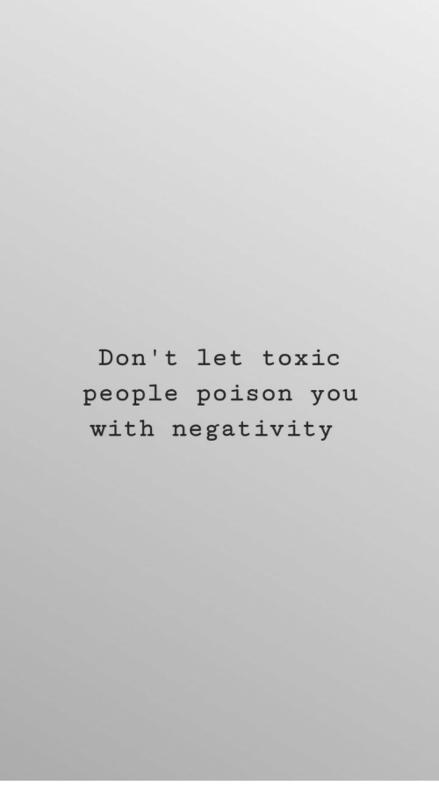 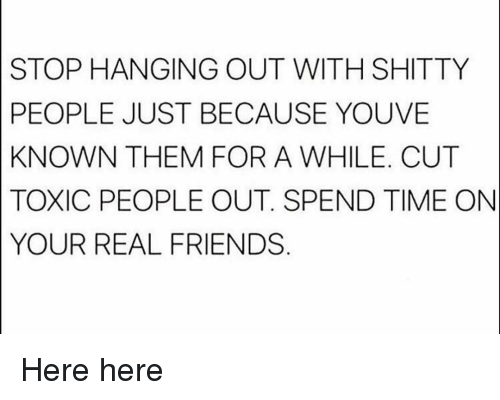 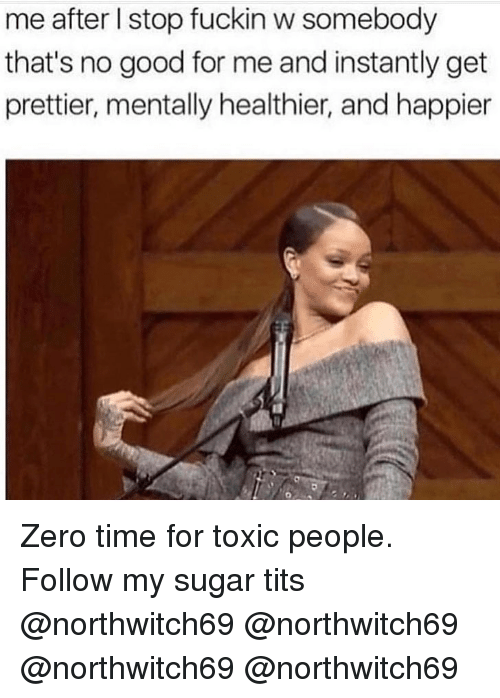 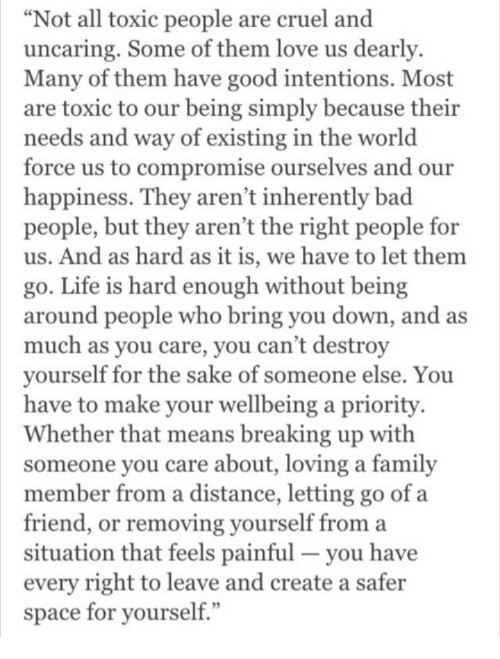 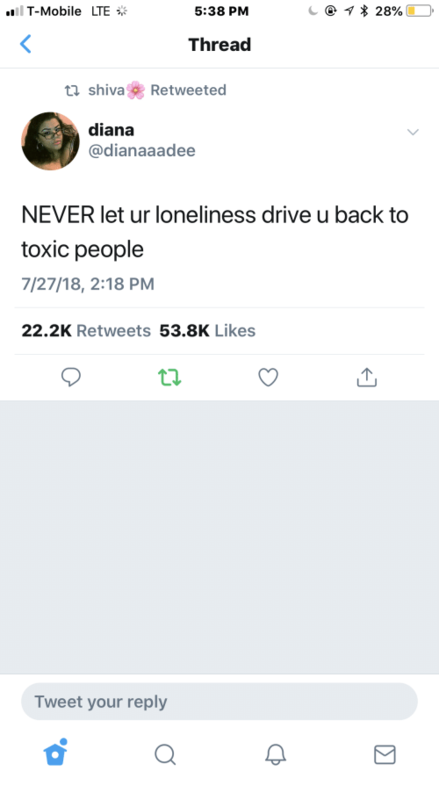 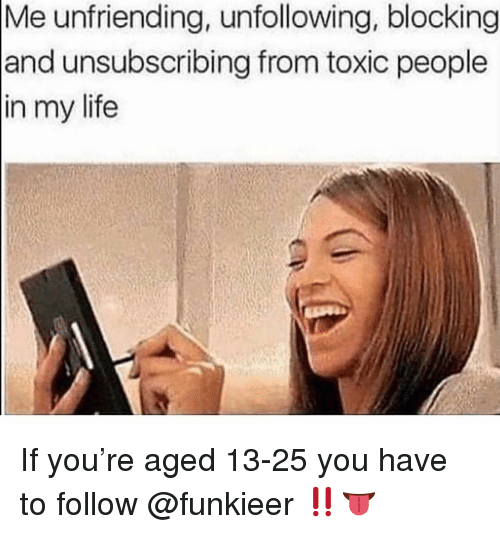 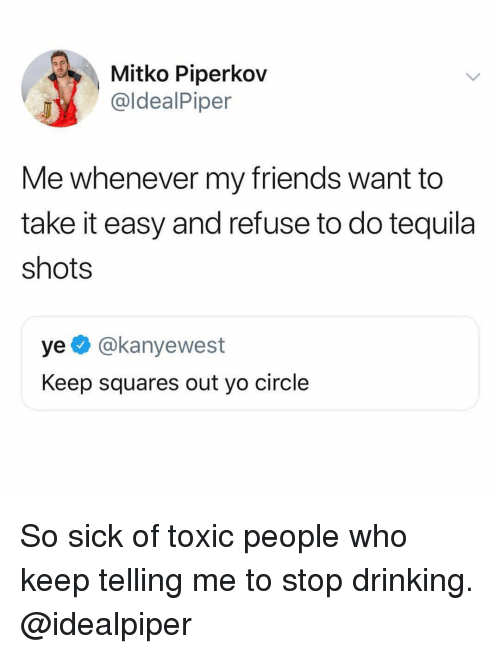 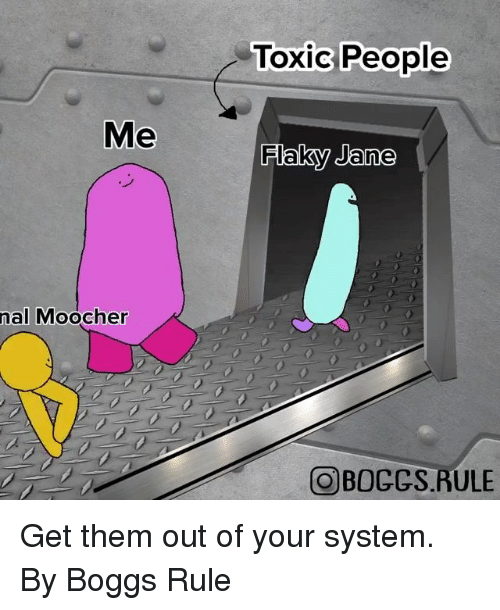 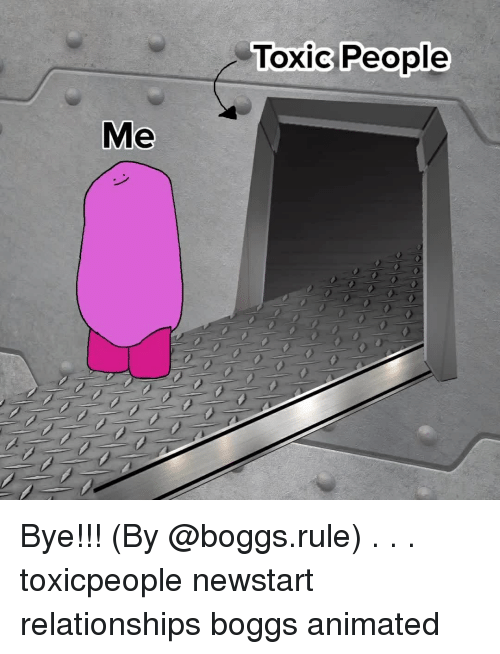 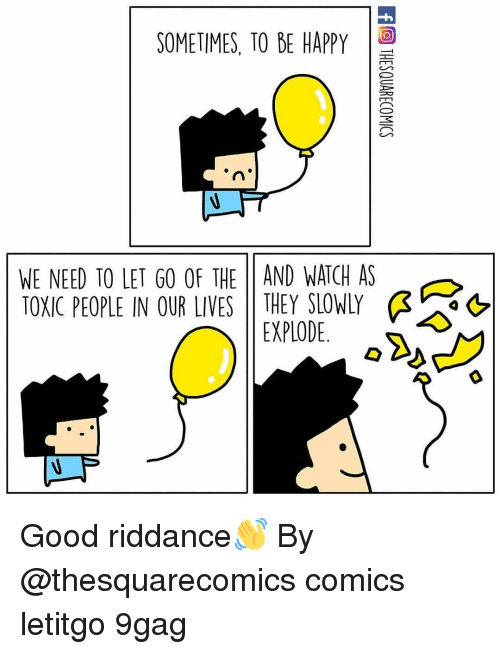 Life, Okay, and Toxic: IT'S OKAY TO CUT OFEF TOXIC PEOPLE FROM YOUR LIFE. 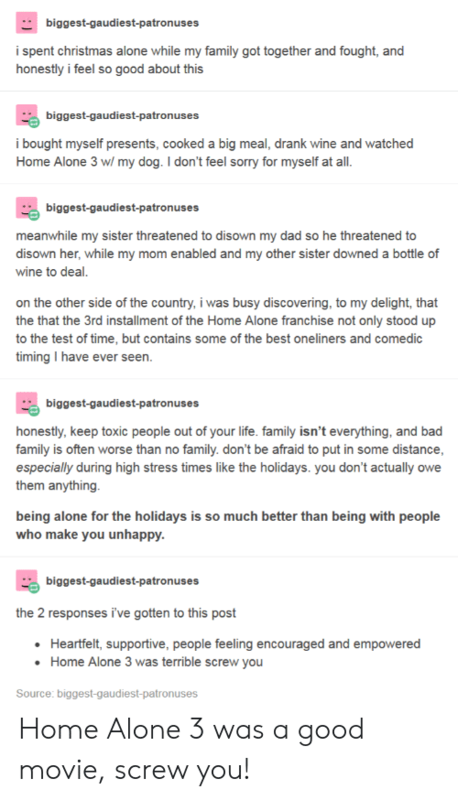 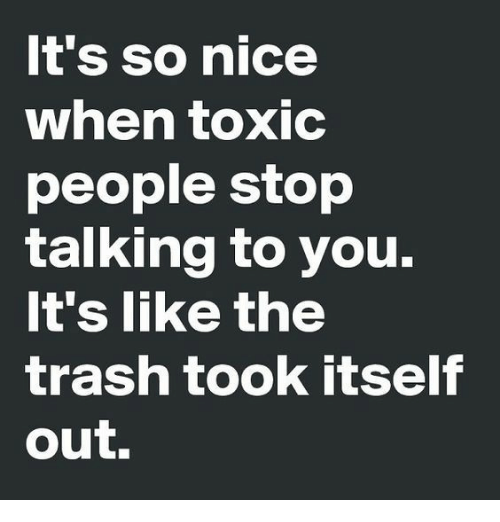 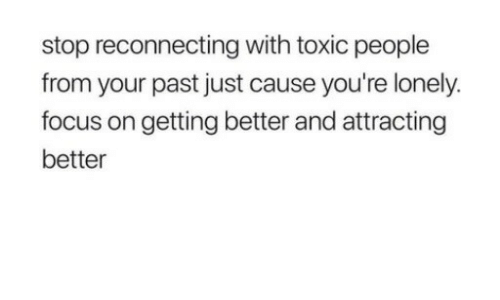 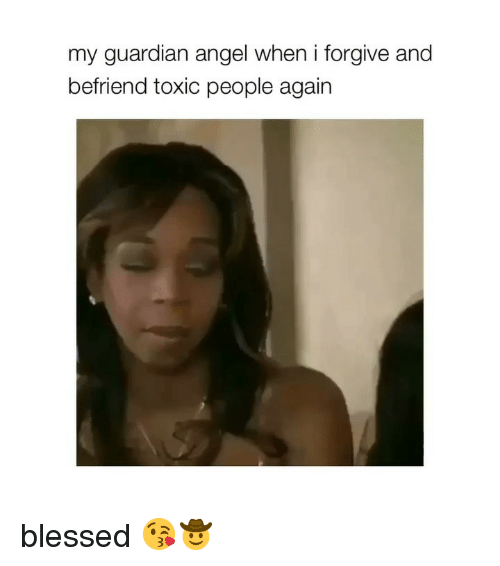 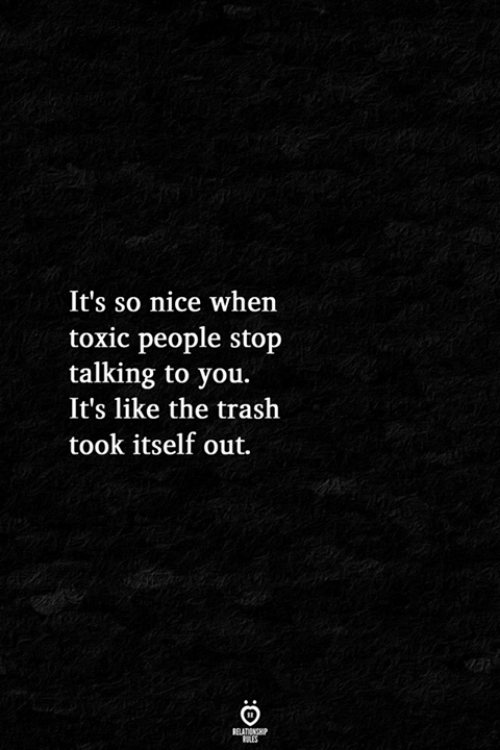 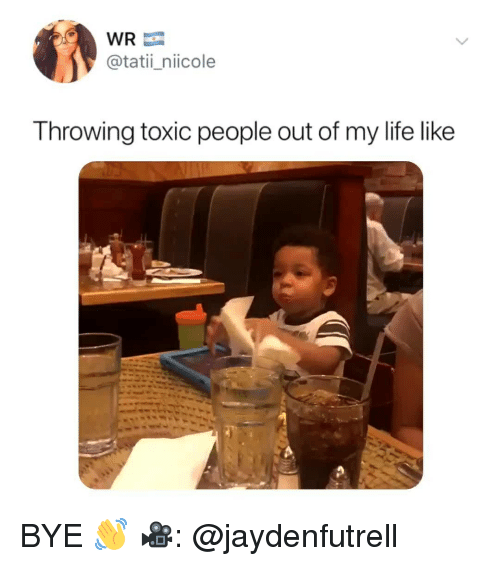 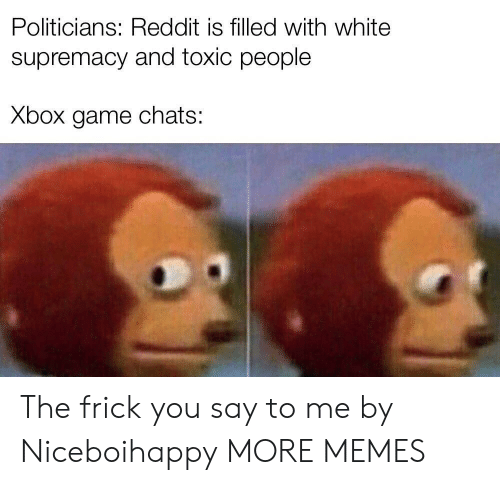 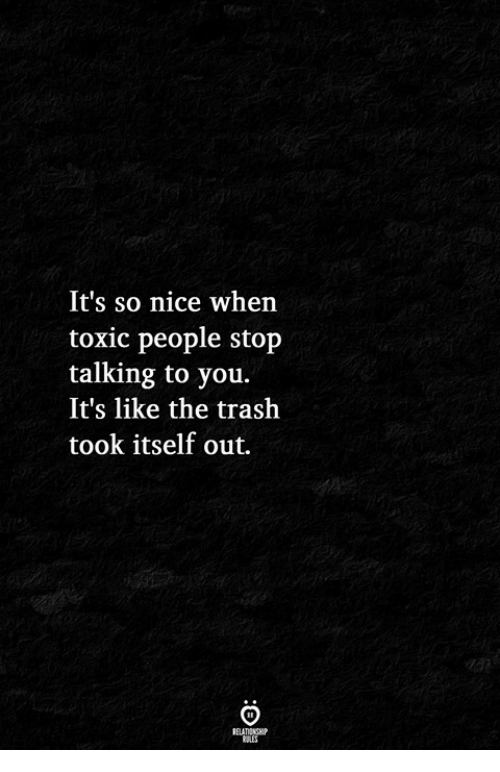 Trash, Nice, and You: It's so nice when toxic people stop talking to you. 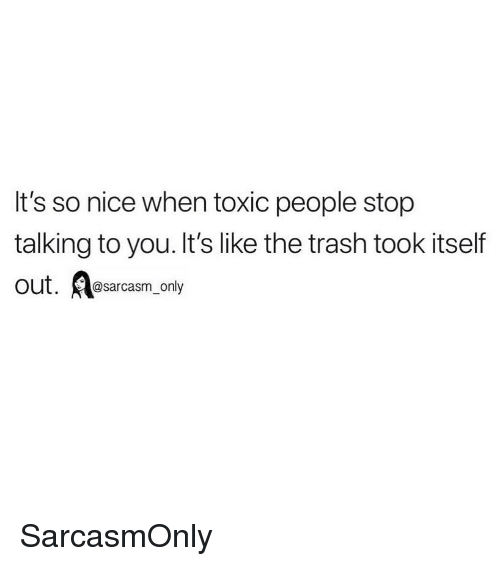 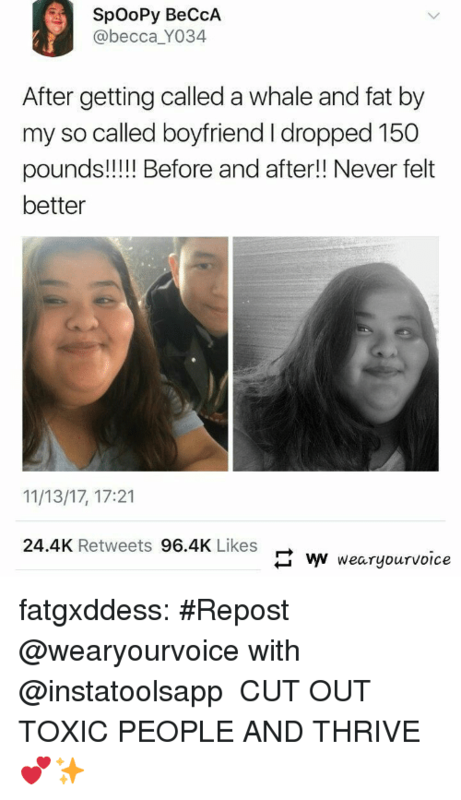 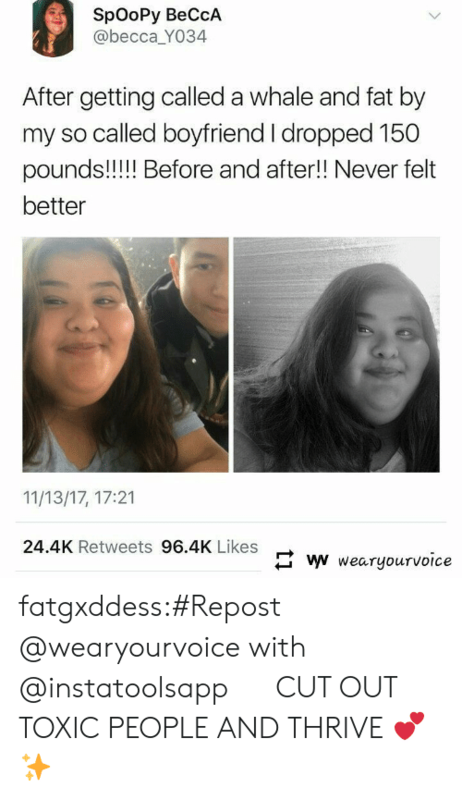 It's like the trash took itself out. 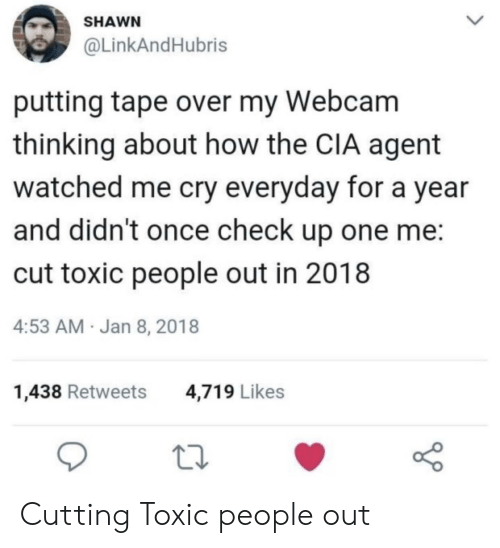 Girl Memes, How, and Cia: SHAWN @LinkAndHubris putting tape over my Webcam thinking about how the CIA agent watched me cry everyday for a year and didn't once check up one me: cut toxic people out in 2018 Honestly the CIA is so inconsiderate sometimes. 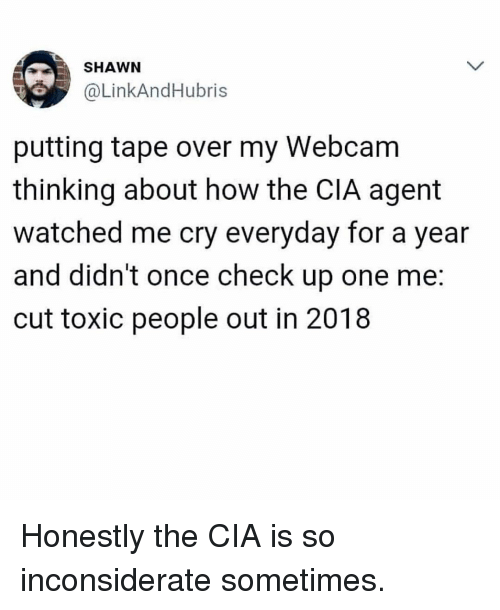 Honestly the CIA is so inconsiderate sometimes. 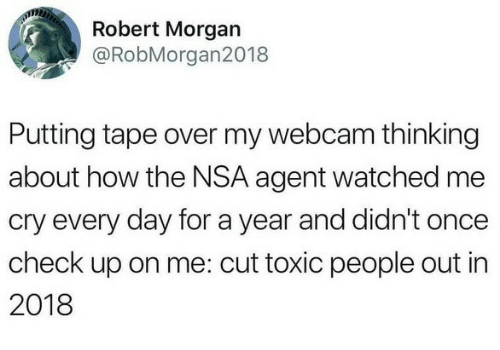 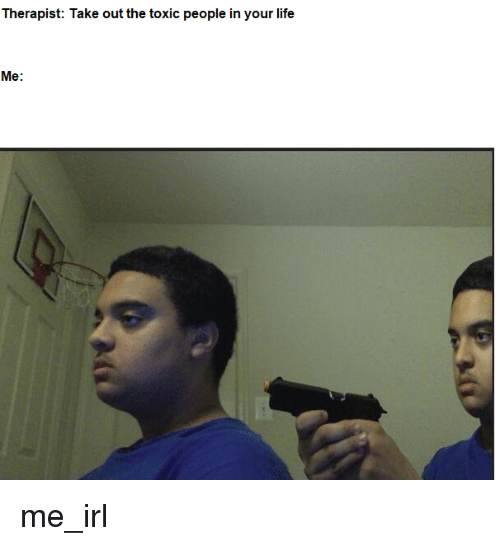 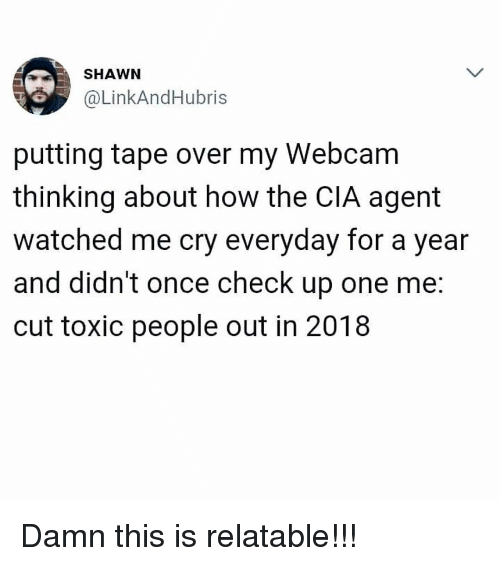 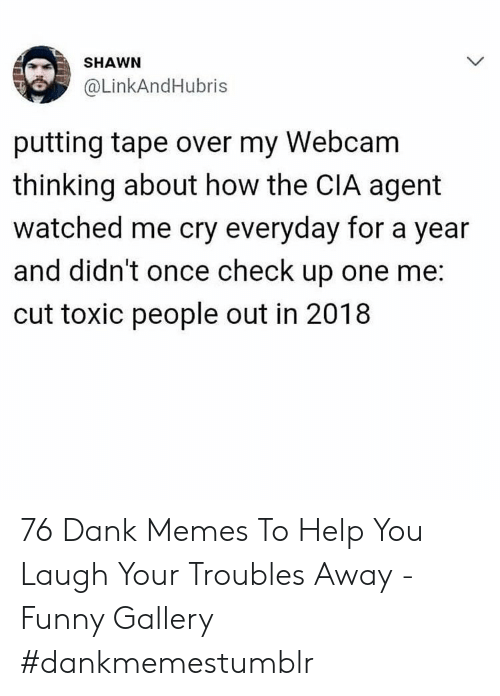 Memes, Relatable, and 🤖: SHAWN @LinkAndHubris putting tape over my Webcam thinking about how the CIA agent watched me cry everyday for a year and didn't once check up one me: cut toxic people out in 2018 Damn this is relatable!!! 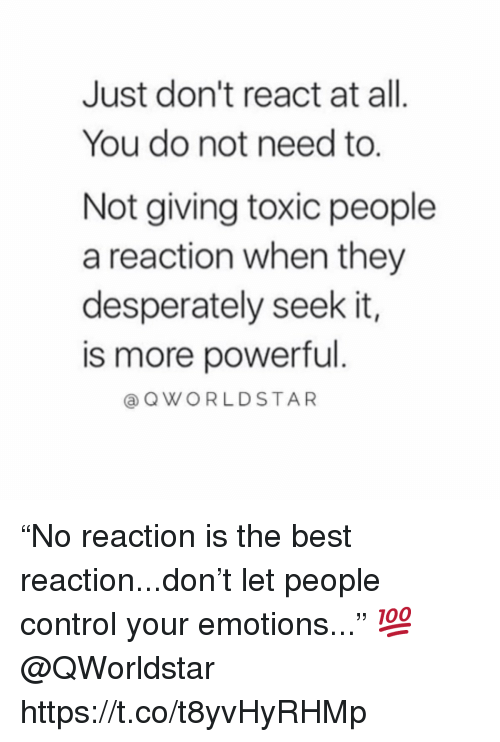 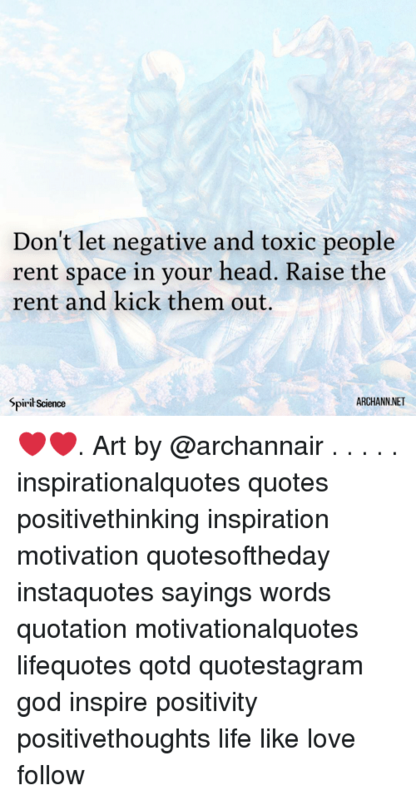 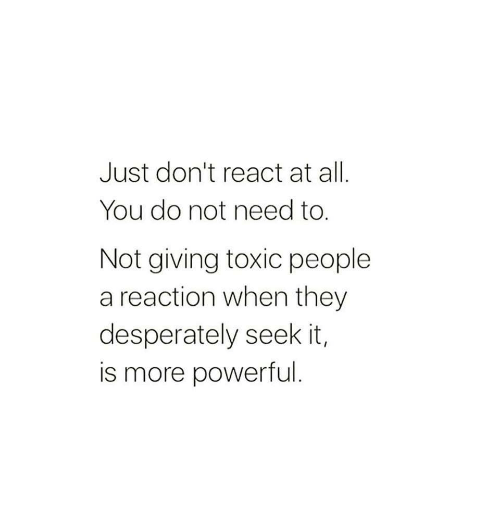 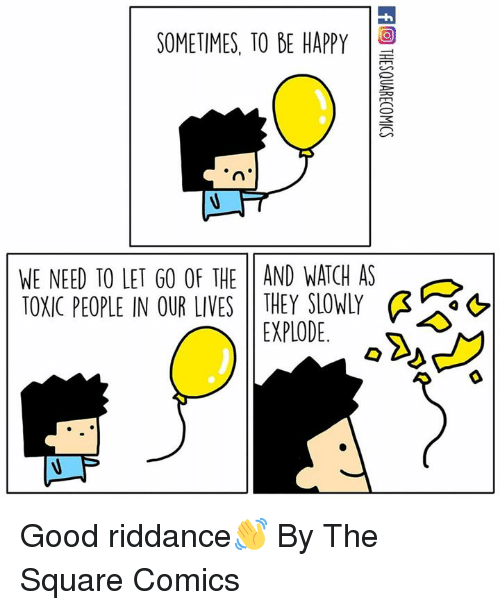 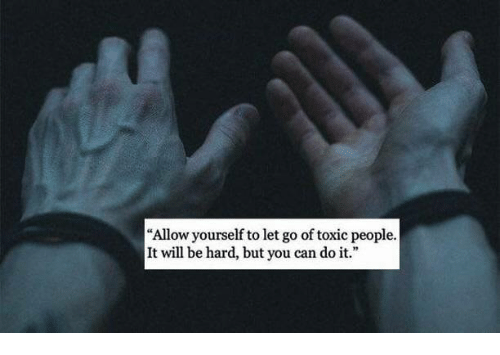 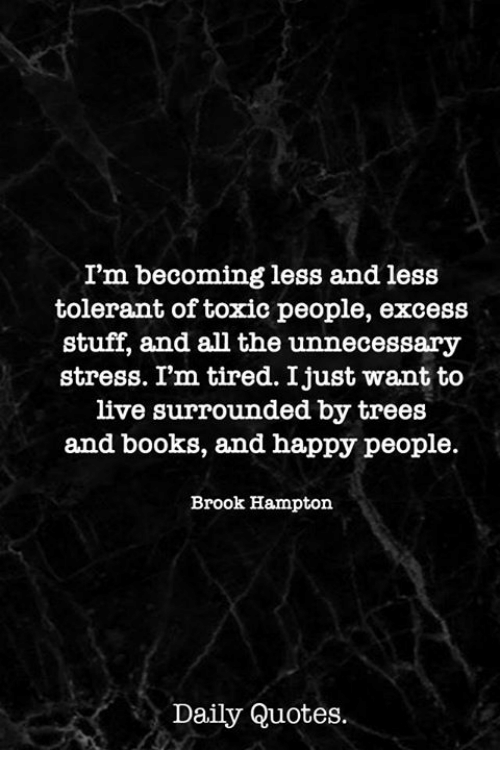 Can, Will, and You: Allow yourself to let go of toxic people. 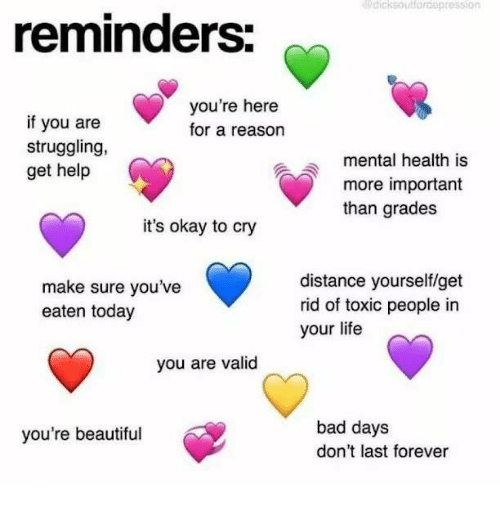 It will be hard, but you can do it." 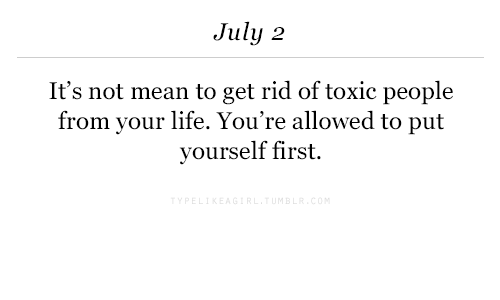 Life, Mean, and First: July 2 It's not mean to get rid of toxic people from your life. 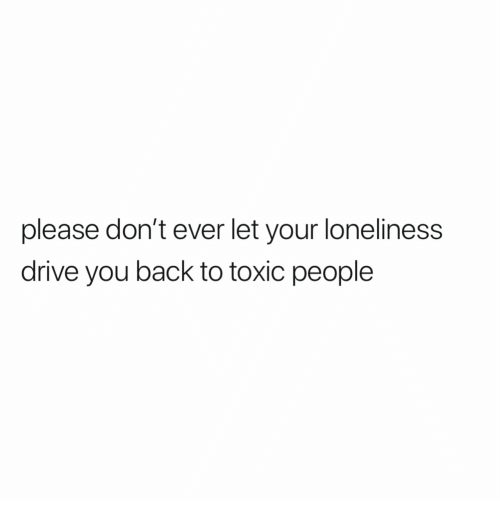 You're allowed to put yourself first. 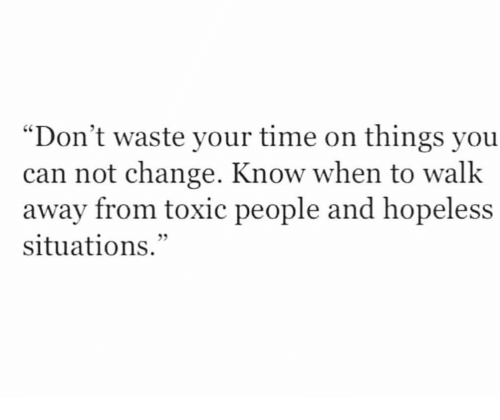 Time, Change, and Can: "Don't waste your time on things you can not change. 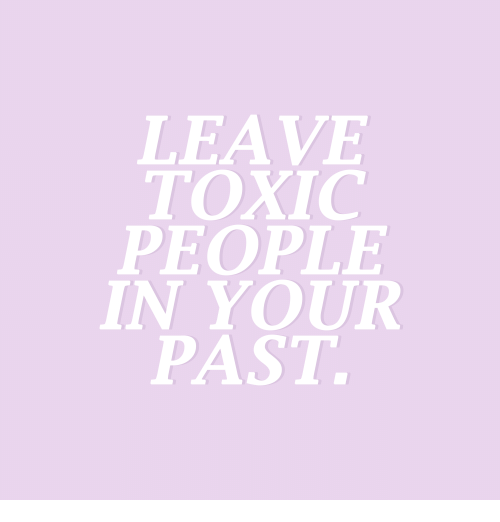 Know when to walk away from toxic people and hopeless situations."